In autumn 2014, Freightliner launched the grain haulage service, thus entering the agro market. Currently, with a fleet of almost 200 wagons designed for the grain and feed material haulage, our company is an important player in the transport market of these products. We work jointly with many entities in the market offering haulage services on domestic routes, to the harbours and on international routes, mainly to Germany, from the Czech Republic and from Hungary to Poland. Freightliner pioneered the reloading of agri-products at public ramps in Poland, without the use of elevators, which influenced the dynamic development of the overall market of such shipments. This enabled many clients, previously isolated from railway services, to use this mode of transportation in their logistics. 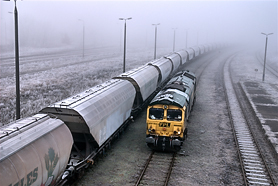 We also transport lime fertiliser using our fleet of Ea-type wagons, where we provide comprehensive services, with unloading and delivery to the customer. We provide services for the transportation of hard grain such as wheat, corn, barley, rye, rapeseed, soy and sunflower meal. We have implemented all the necessary procedures to guarantee haulage in safe and hygienic conditions in compliance with GMP + HACCP standards and guidelines. We meet all necessary requirements for the proper delivery of these services in the territory of the European Community. We work alongside the best trans-loaders, guaranteeing optimal conditions of reloading.